FAIRBANKS, AK - Nathaniel was up all night packing so we packed him in the back of Paul's truck for the ride to the Fairbanks airport to catch a flight to Arctic Village: Stage one of getting to the Kongakut. YUKON RIVER, AK - En route from Fairbanks to Arctic Village crossing the Arctic Circle over the Yukon River. 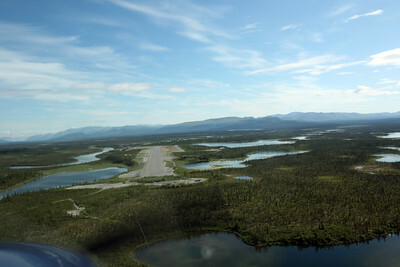 ARCTIC VILLAGE, AK - Comming in for a landing. 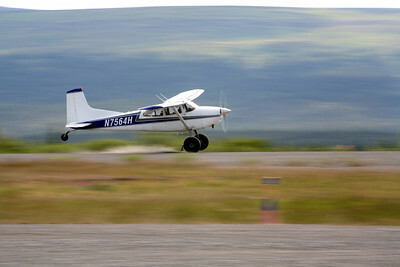 Aboard a Cessna Grand Carivan operated by Wright Air from Fairbanks. 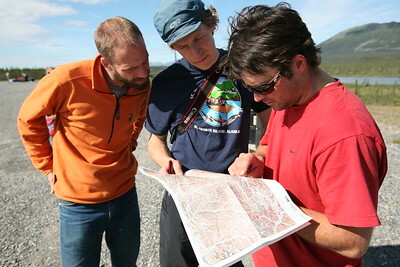 ARCTIC VILLAGE, AK - Sune and Nathaniel get some river beta from river guide, Matt, who is leading a commercial trip on the Kongakut. 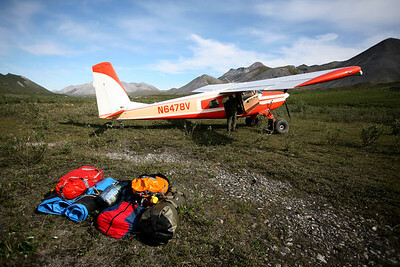 ARCTIC VILLAGE, AK - A Cessna 185 with tundra tires lands on the gravel airstrip. 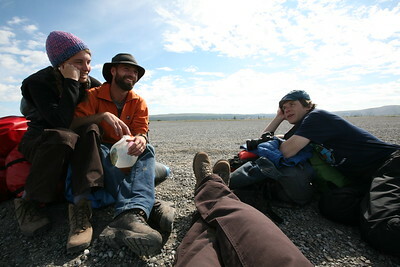 ARCTIC CIRCLE, AK - Chilling at the airstrip after our flight in the Cessna Grand Carivan from Fairbanks. 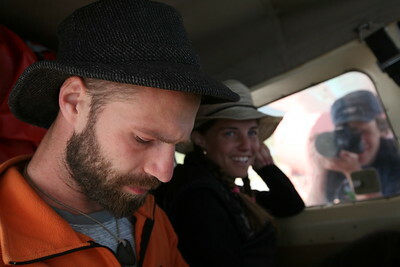 Next flight in the Helio to the Kongakut Headwaters. 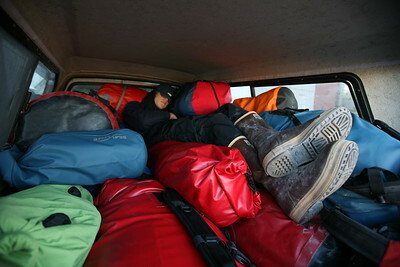 ARCTIC VILLAGE, AK - Sune & Lindsay are loaded in the Hilio Courier with a bunch of gear ready to fly into the Kongakut. 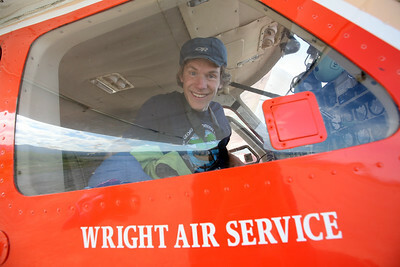 ARCTIC VILLAGE, AK - Nathaniel climbs into the front seat next to the pilot in the Wright Air Service Helio Courier to fly to the Kongakut. ARCTIC VILLAGE, AK - Lindsay looks out the window of the Helio Courier aircraft that will take her, Sune and a pile of gear to the headwaters of the Kongakut River. 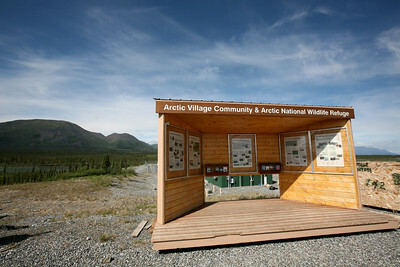 ARCTIC VILLAGE, AK - An information booth about the history of Arctic Village and the Arctic National Wildlife Refuge at the Arctic Village airstrip. 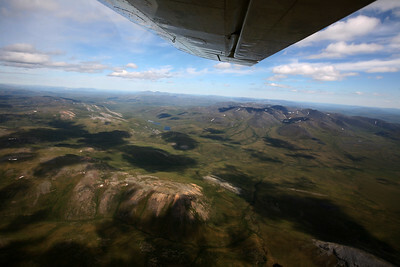 BROOKS MOUNTAINS, AK - Aboard the Helio Courier flying above the Arctic National Wildlife Refuge to the Kongakut River. KONGAKUT RIVER HEADWATERS, AK - Helio pilot Ken puts the seat back into the plane. The seat has to come out to access the cargo space avaliable in the Helio Courier. 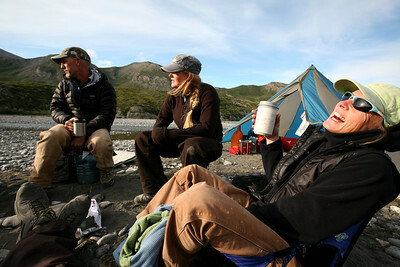 KONGAKUT RIVER, AK - Camp I: Headwater. Nathaniel carries one of the inflateable kayaks (ducky) from the last of three flights into our first camp about 16 river miles above Drain Creek where the commercial guide services start their trip. 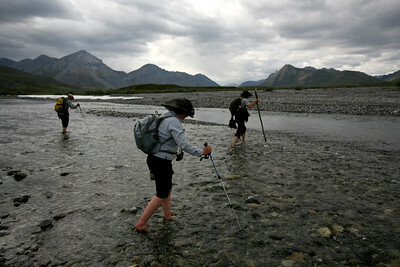 KONGAKUT RIVER, AK - Camp I: Headwater. Natalie never stopped laughing the whole trip. 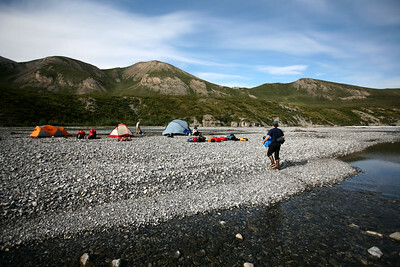 KONGAKUT RIVER, AK - Camp I: Headwater. 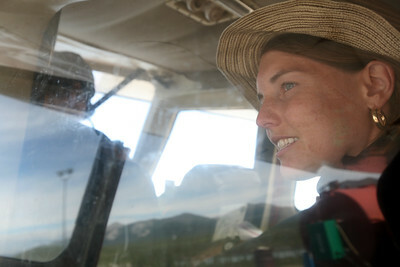 Lindsay scans the hillside to the north for animals in the arctic midnight sun. 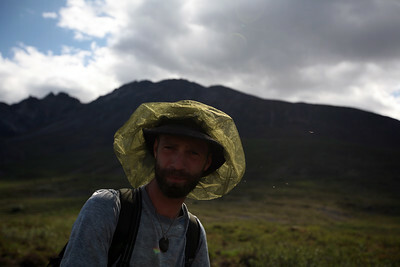 KONGAKUT RIVER, AK - Hiking around the headwaters, Sune is ready with his headnet to protect him from the bugs. KONGAKUT RIVER, AK - Hike I: Headwater. Bobby, Jesse & Sune (l. to r.) use walking sticks to balance as they brave the icy snowmelt waters of the upper Kongakut on our first hike. 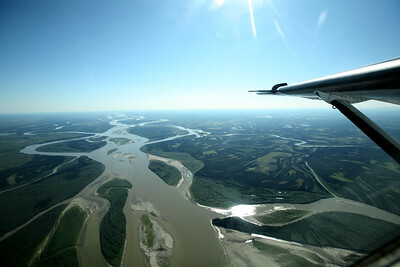 We're heading up river to look for the heard of 1500+ caribou spotted on the flight in. 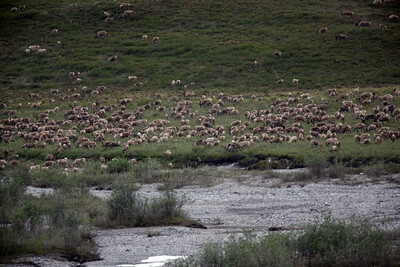 KONGAKUT RIVER, AK - Headwaters hike: we find the herd of caribou. Estimate about 1,500+ animals total (beyond this image). KONGAKUT RIVER, AK - Hike I: Headwater. 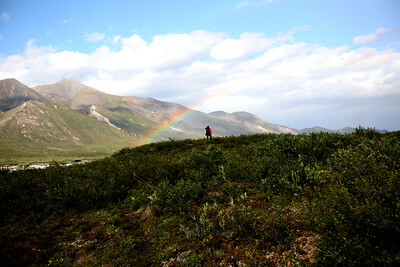 Nathaniel marches towards the rainbow that blessed us on our hike back to camp after finding a huge heard of caribou. 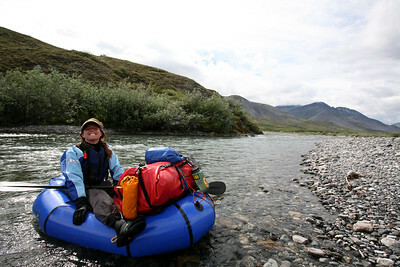 KONGAKUT RIVER, AK - Lindsay is happy to be on the river. 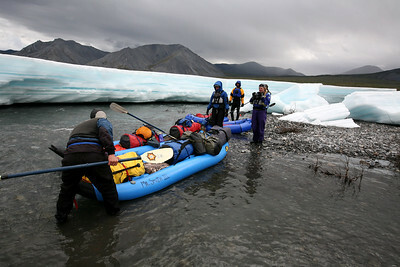 KONGAKUT RIVER, AK - Bobby pulls his inflateable kayak (ducky) from the pebble bar after the group stops amongst the ice to stand, stretch and jump around some to warm up. 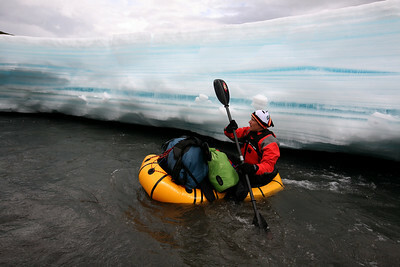 KONGAKUT RIVER, AK - Nathaniel manovers in his packraft past the ice along the side of the river. 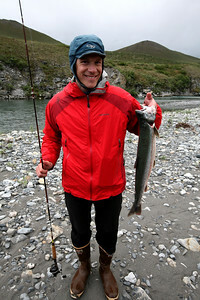 KONGAKUT RIVER, AK - Camp II: North Bend; Nathaniel hooks a 5 pound arctic char for dinner. 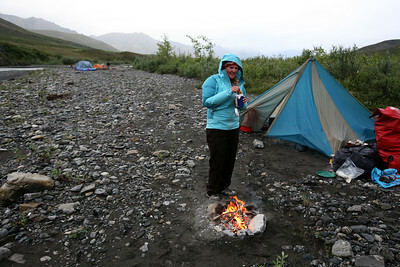 KONGAKUT RIVER, AK - Camp II: North Bend; Jessie warms up with a hot drink by the fire.